I’ve never been crazy about sloths. Look at their cuteness. UNREASONABLE. They are cute. And slow. And mostly cute because they’re slow. But they’ve just never been on my animal radar. Dolphins were more my speed. And dogs. Dogs are so flippin’ AWESOME! Long story short, it was never a life dream of mine to cuddle with sloths, or watch them lazily reach for a branch or shimmy down a tree with the dexterity and speed of a totally baked person. Maybe I just hadn’t spent enough time on YouTube. 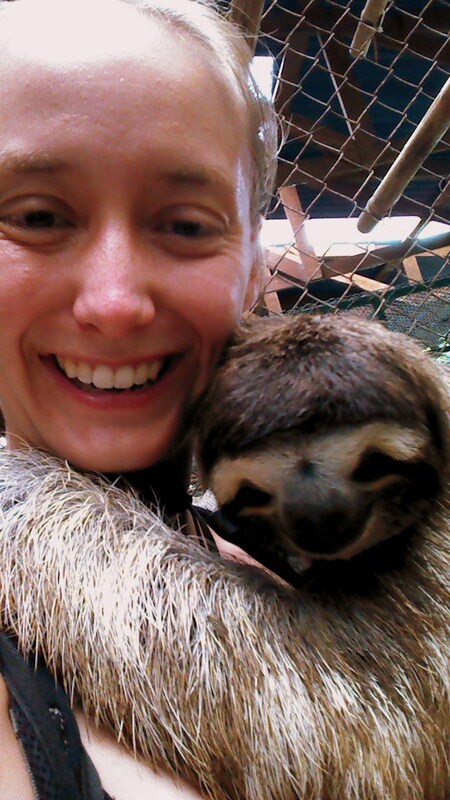 So when my friend decided she wanted to see sloths while we were in Costa Rica, my first instinct was to say, “Sure. We’ll spot them off the side of the road,” and leave it at that. They’re all over the place anyway there, how hard could it be? 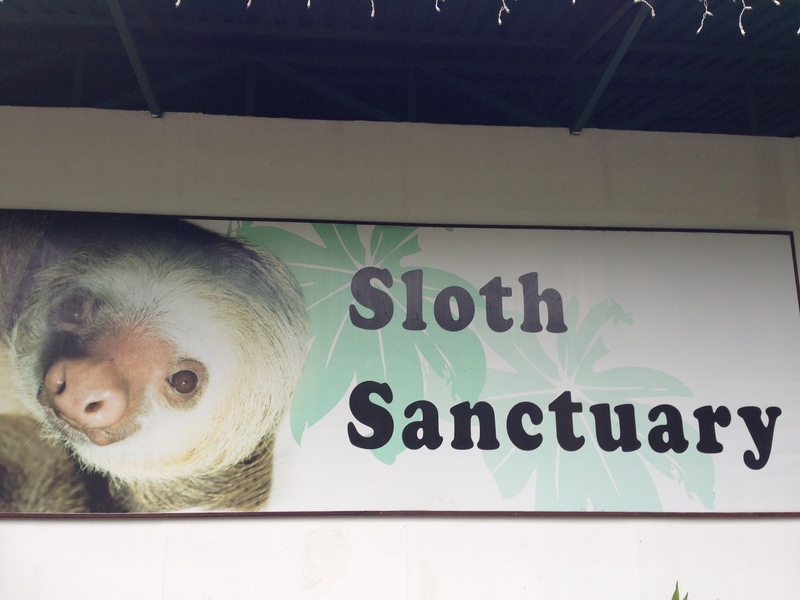 But then I learned about the Sloth Sanctuary just outside of Cahuita. This is one of their sloths who needs a bit of medical attention. He likes staying cozy under the blanket. Perhaps it was a mistake to share the link with said friend, who loves sloths on a Kristen Bell-esque level (minus all the crying). Perhaps it was a mistake, too, to agree to the hefty splurge of the Insider’s Tour ticket. (In my defense, it was the first reservation I made for the trip, long before I remembered that a) I was broke and b) wait, there is no b; refer to a.) At least it’s a donation. So it was that I found myself covered in adorable, eerie sloths, which I never in a million years expected. Ever. The sloths! They are EVERYWHERE! Other than special badges, and a full breakfast, and a private canoe trip during which howler monkeys serenaded us and we glimpsed bats sleeping together, one enfolding part of another in its wing in the niche of a log, AND a private tour of the sanctuary, we got special access to interact with the sloths. Reflecting now, I realize just how cute AND KINDA CREEPY sloths are! For the sloth/person hangout time, basically we went into an enclosure that has bars they can hang onto. 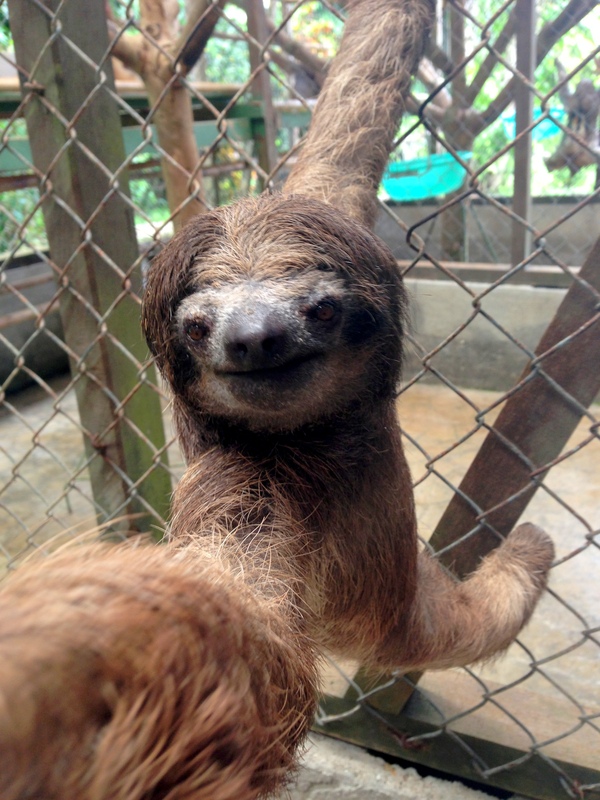 When the sloth, who just wants to be loved, sees you, their little face turns toward you. But it’s just so adorable, you say, what with its little smile! To you I say, HOW DO YOU NOT SEE THE RESEMBLANCE BETWEEN A SLOTH AND A CREEPER!? Anything that smiles in such a Stepfordian way gives me the heebie-jeebies. 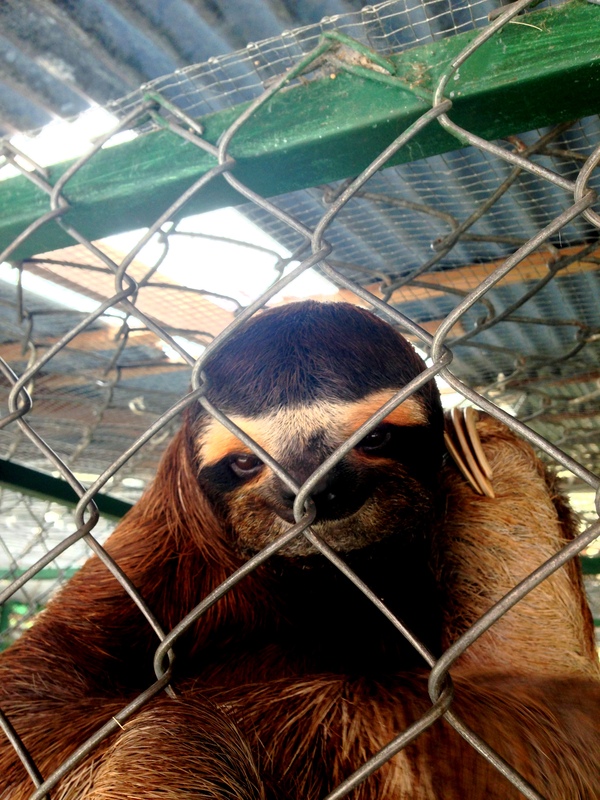 How does this sloth NOT look like it’s plotting to kill you? So it’s turning to you, which is either cute or horrifying, and it reaches out for you with its little slothy legs, and you hold it like a baby. Because that’s also what it reminds you of, except for that crazy smile and the Lone Ranger eye mask. And as you hold it, you realize how dang SHARP its toes are! Those claws are not something to mess with. SLOTH CLAWS ARE HUUUUUUUUGE AND SHARP! But it hugs you (mostly) gently and you pet its coarse fur and I guess the cute outweighs the creepy. 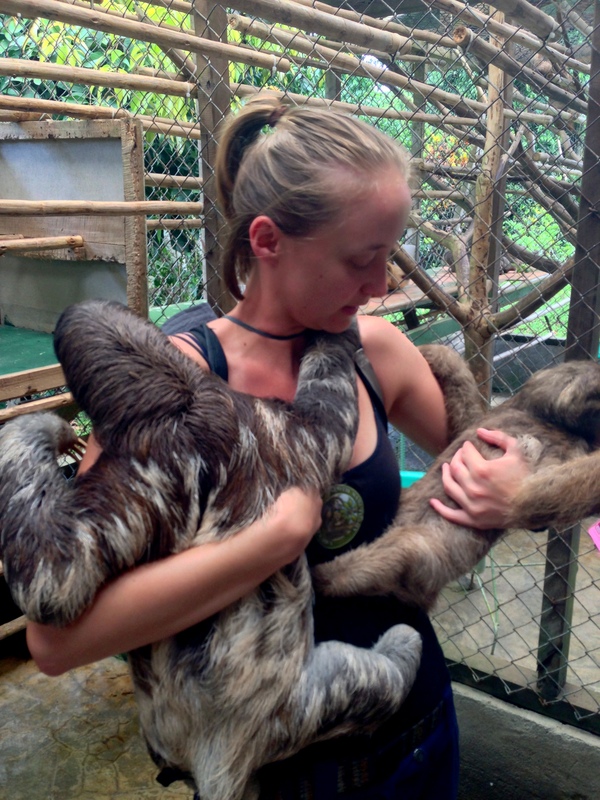 Tours of the Sloth Sanctuary don’t just give you access to the animals themselves (though for a lot of people that’s the only reason they book a tour). I learned a lot about sloths! Not that I started with a lot of info, but whatever. Learning about sloths is fun! A sloth’s grip is so vise-like on a tree branch that even after they’ve died they can remain hanging from their claws. 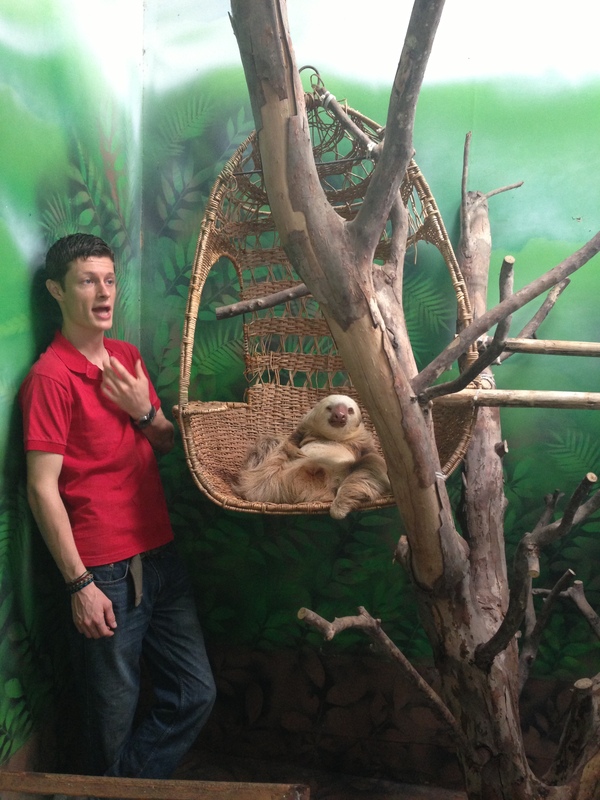 In captivity, however, sloths can be really social! We heard a really sweet story of a pair of sloths–one male, one female–who were both brought into the sanctuary as newborn orphans. At the time, there was only one incubator, so they had to share. They’ve been inseparable since, and even share their habitat. Sloths poop once a week and have to climb allllll the way down from the trees to do it. One of the biggest lessons Costa Rica reinforced for me was that humans basically ruin everything cool ever that nature has created. Our relationship with sloths is no exception. Most of the sloths who now live at the sanctuary were maimed or left orphaned due to accidents with electrical lines or automobiles. Uncle Sloth wants YOU to help prevent endangerment. Well, you can donate to a number of conservation efforts around the globe. 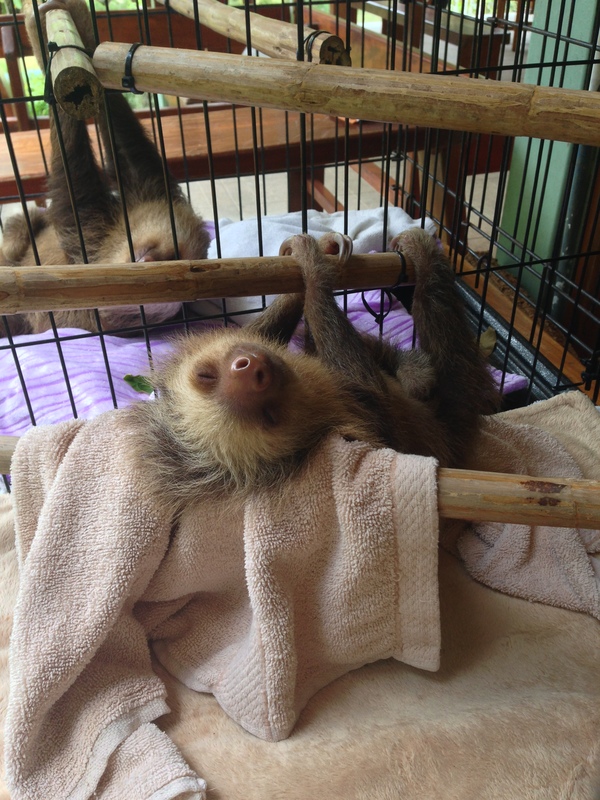 In Costa Rica, you can certainly donate to the Sloth Sanctuary or visit. There are 2 types of tours, and they even have a B&B. Proceeds from ticket sales go to continuing the mission of the sanctuary. 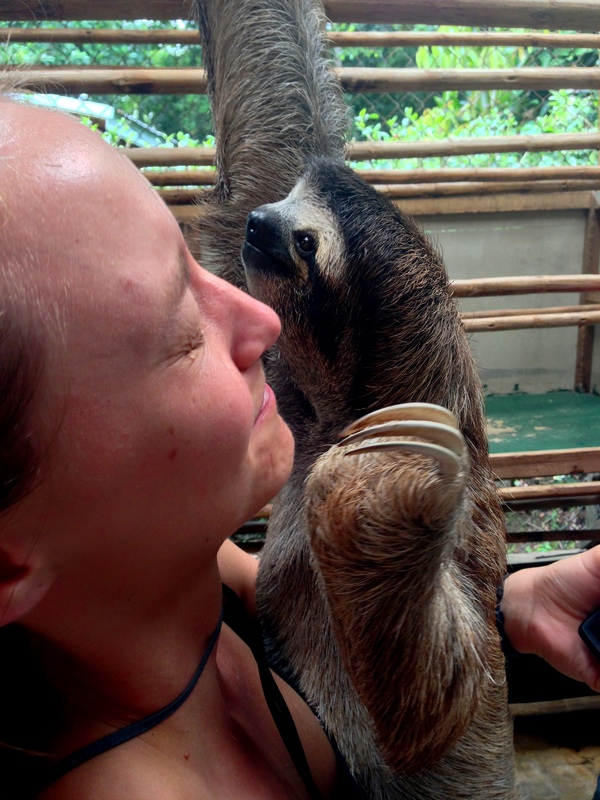 Another place in Costa Rica that rehabilitates sloths is the Jaguar Rescue Center. Located in Playa Chiquita, close to Puerto Viejo, this center also works to aid other animals, too. You can donate to them with money or specific goods OR volunteer! And finally, if you’re traveling in a sloth-filled country like Costa Rica, remember that they are wild animals. If you spot a sloth in the wild, don’t feed it or mess with it; admire from afar. If you do encounter an injured sloth on the road, see if you can take it to a nearby conservation center. *It turns out, spotting a sloth from a moving vehicle is very difficult for a gringa like me. All our naturalist guides could do it like it was no problemo, but not this gal. Sara, That was one of your best blogs! (Flawless except for one typo “the” for “they” in the “they are wild things” section.) 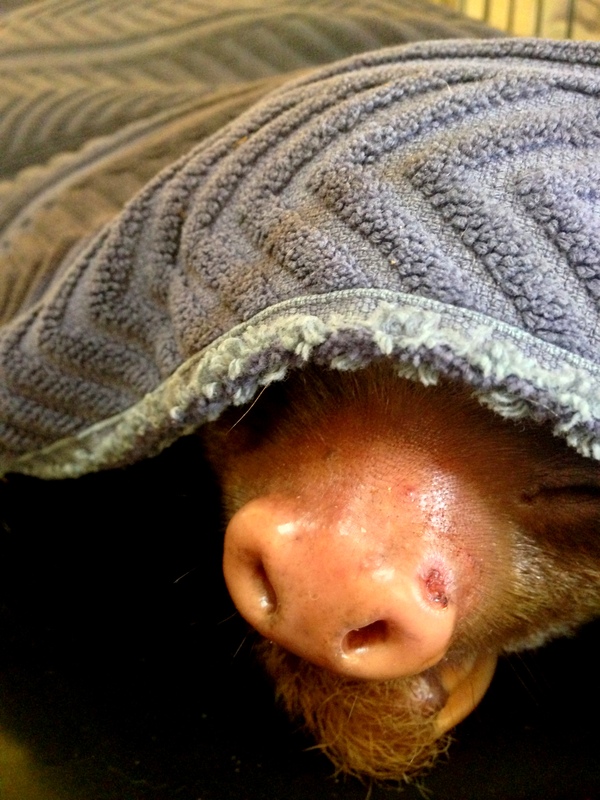 Until I read this blog I thought even being near a sloth would be disgusting! I even though they might be dangerous in captivity as many other wild things are.